In BORDERS UP! Vitali Vitaliev travels to Hungry, Poland, the Czech Republic, Slovakia, Bulgaria and Romania in an attempt to find out why drinking in post-Communist Eastern Europe has increased dramatically since the fall of the Berlin Wall. Why is it that countries once ruled by a strong hand are now, ruled by strong drink? Staggering from the beer halls of Plzen to the wine cellars of Romania, Vitali volunteers himself for all the wines, beers, and spirits on offer, everything from Nicolae Ceausescu’s favourite tipple (as naff as he was), to gold flaked vodka and a ‘healing’ Hungarian liqueur with crippling side-effects. 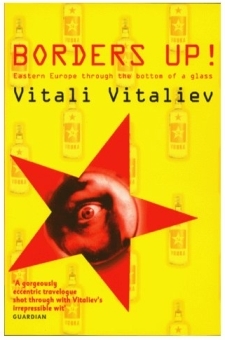 In a bottle-and-soul opening journey, Vitali discovers a post-Communist population increasingly contemptuous of the values imported from the West: of rampant capitalism embodied by fast-food and Michael Jackson tours, but also a population vigorously defiant in the face of hardship. As well as exploring the damage to societies ruled by alcohol, where death or vodka may be the only escape. BORDERS UP! Is full of wit, insight and compassion for people who have suffered far worse than a hangover. Vitali Vitaliev was an award-winning journalist in the former Soviet Union, who became know in the UK through his appearances as the Moscow correspondent on Clive James’ Saturday Night Clive. Hounded out of the USSR by the KGB in 1990, he was granted Australian citizenship and lived there until 1992. Since coming to England has made several TV travel documentaries, written for The Spectator, The Guardian and The Daily Telegraph and has been a regular roving reporter for BBC Radio 4. His previous books include Special Correspondent, Little is the Light, Dateline Freedom and Dreams On Hitler’s Couch. He now is working on an examination of the differences between America and Russia in the new century.